It's that horror game from the creator of Alone in the Dark. 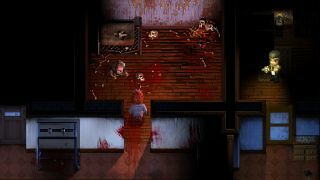 2Dark—that top-down horror game from Frédérick Raynal, AKA the dude behind Alone in the Dark—is still a thing, and seemingly a thing will release sometime this year. I'm still fascinated by its garish visual style, which features grainy, low-res, bobble-headed characters in a jarringly higher-def world, and now a few more details about the game's mechanics have come to light, courtesy of a new, disappointingly footage-free trailer, and the accompanying press release. First, here's that trailer, which explains how a grizzled former detective comes to be sneaking around a creepy house, rescuing kids from murderers. My concerns over the art style aside, 2Dark is an intriguing game, mixing horror with stealth with (seemingly) Abe's Oddysee-style NPC-escorting, not to mention that novel bit at the end about save points potentially getting you killed. The dare-I-save tension was one of the best parts of Alien: Isolation, and I hope it's as well implemented here. 2Dark will be out this year, and you can now look at the Steam page, should you so desire. The system specs are on there too, but they're not particularly steep, so you should be alright.